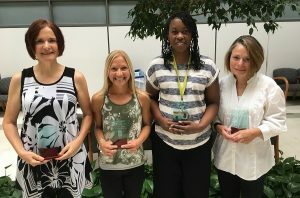 (L-R) Maryann Abendroth, Jamie Mayer, Danai Fannin, and Patricia Tattersall. The recipient of the 2017 Diversity Award for Academic Excellence is Patricia Tattersall, Associate Professor of Speech-Language Pathology in the School of Allied Health and Communicative Disorders. After attending the Multicultural Curriculum Transformation Institute (MCTI), Tattersall transformed her COMD 429 course “Assessment in Communicative Disorders”, and wrote a chapter entitled, Diversity within Disability, which was used in the 2013 NIU Higher Learning Commission Report. She also discussed the impact of course transformation on students and instructors to future Institute participants. Tattersall facilitated communication between the Illinois Speech-Language-Hearing Association (ISHA) and the American Speech-Language-Hearing Association (ASHA) to build a case against ACT/SAT for discrimination of individuals with language impairment. This expanded to include the LSAT and GMAT. The Department of Justice ruled in favor the students, who as of January 1, 2017, receive appropriate accommodation. Mayer is not only an outstanding teacher in the classroom, she engages students in research, supervising multiple undergraduate honors capstones and master’s thesis projects above and beyond her assigned workload. The overwhelming competence and passion exhibited by Mayer’s students as they present their research is a testament to her positive impact on student learning. The recipient of the 2017 Fisher Award for Excellence in Service is Danai Fannin, Assistant Professor in of Speech-Language Pathology in the School of Allied Health and Communicative Disorders. Fannin has demonstrated her dedication to service to the profession, the public, and the institution. Public service at NIU has taken the form of organizing a caregiver support group of families of children with autism. Fannin has participated in national professional service through leadership on several committees, CEU coordination, and article reviews. Her institutional service includes advising student organizations and an abundance of committee work. The recipient of the Sullivan Award for Excellence in Research is Maryann Abendroth, Associate Professor in the School of Nursing. Abendroth’s work has been productive in terms of grant awards, applications, and publications. She has published articles related to the health and well-being of caregivers, and developed a valid and reliable instrument measuring the risk of strain among caregivers of persons with Parkinson’s disease. She’s been active in pursuing external funding throughout her academic career. Specifically, Dr. Abendroth has written and collaborated on a variety of research grant proposals and has received grant funding totaling $50,000. Abendroth’s collaborative research efforts with students are also impressive. Her grant from the American Nurses’ Foundation provided for an undergraduate nursing research assistant who worked with Abendroth on her project related to caregivers of persons with Parkinson’s disease. Abendroth also served as a preceptor for a Ph.D student in a research practicum course focusing on this Parkinson’s study. Working with both students resulted in a poster presentation at the American Holistic Nurses Association national conference this past year.